I’m sitting in gridlock in Boston’s Chinatown neighborhood on a Thursday afternoon. It’s a typical Boston rush hour—traffic isn’t so much driving as oozing through town. Less than a block away, Interstate 93 is in even worse shape; a snarl of commuters is beginning a painful crawl home to the suburbs. Thankfully, I’m not behind the wheel. I’m in the back of a 26-foot RV driven by Tufts environmental engineering student Jess Perkins, E12, and recent grad Dana Harada, A11. They are regulars in Chinatown. But unlike scores of frustrated commuters on I-93, they don’t have a destination. They simply drive in circles. “It’s like going on a road trip twice a week,” says Perkins. Sometimes the two listen to country; mostly, they just talk. With every lap through Chinatown, Perkins and Harada are hard at work, collecting air-quality data for a five-year interdisciplinary study based at Tufts called the Community Assessment of Freeway Exposure and Health (CAFEH). The goal of the study, expected to wrap up a year from now, is to understand how vehicular pollution affects the health of people living close to a highway. Over four years, the RV has racked up more than 15,000 miles circling the Boston-area communities of Chinatown, Dorchester, Somerville and Malden. Behind the driver’s seat, where I’m sitting, a mobile laboratory measures airborne pollutants: gases, such as nitrogen oxide and carbon monoxide, and tiny solids called ultrafine particulate matter. Of the three, the ultrafine particulates are arguably the biggest threat to public health. “When it comes to air pollution, the main thing that really affects people is particulates—not gases,” says Doug Brugge, the study’s principal investigator and a professor of public health and community medicine at Tufts. Because of their small size—some are just a few molecules across—tiny particulates are essentially minuscule bullets, delivering toxins deep into the body where larger particles can’t reach. “The Environmental Protection Agency estimates that they cause 80,000 or 100,000 deaths a year in the United States, and maybe four million or more worldwide,” Brugge says. Tracking air pollution today is a far more subtle job than monitoring the haze of pollutants a few generations ago ever was. Before the U.S. government first allocated funding for air pollution research, in 1955, entire regions could be swallowed by smoke and smog. In 1948, residents of Donora, Pa., a mill town just south of Pittsburgh, woke to a dense cloud of particulate pollutants that had become trapped in the Monongahela River valley by stagnant weather. When the smog lifted five days later, 20 people were dead, and nearly half of the town’s 14,000 residents had fallen sick. It was one of the worst air pollution disasters in U.S. history, and its impact on public health was easy to see: “You didn’t have to do statistical analysis. You could just see people come to the hospital and die,” says Brugge. Although U.S. environmental regulations have gotten the big, visible clouds of particulates, such as the industrial sulfur dioxide emissions that contributed to the Donora crisis, under control, Brugge believes there’s still plenty of cause for alarm. Over the last 30 years, growing numbers of studies have shown that smaller particulates emitted by trucks and cars barreling down our nation’s highways can promote heart disease and strokes. The EPA regulates these tinier hazards, to a point, but Brugge is concerned that the agency hasn’t gone far enough to safeguard the health of roadside residents. About 10 percent of the U.S. population—some 35 million people—live within 100 meters of a four-lane highway, according to the EPA. Brugge’s hope is to clarify the implications of this fact by measuring the airborne particulates along the road while monitoring the health of people who live in the vicinity. It’s a task requiring both patience and precision. Fine and ultrafine particles are much smaller than the width of a human hair, with ultrafines posing the greater potential risk to human health. Particulates come in a few different flavors, each smaller than the next, and each with its own implications for public health. Coarse particulates (known as “PM10” in the public health world) measure about 10 microns across—roughly one-seventh the width of a human hair. They’re mostly made up of dust from construction, vehicular tire and brake wear and the road surface itself. As particulates go, they’re not as high on Brugge’s hit list. It’s the really tiny stuff, he says, that poses the real danger: fine particulates (PM2.5)—particles smaller than 2.5 microns—and “ultrafines” (PM0.1), the smallest of the small, at 0.1 microns and below. These are created almost exclusively by combustion. As a car or truck engine runs, its exhaust gases condense into minuscule blobs within seconds of leaving the tailpipe. Some blobs are made up of unburned oil and gasoline; others form out of the countless chemical byproducts of burning fossil fuels. Throughout the 1980s and early ’90s, dozens of studies found links between fine particulate pollution and cardiovascular health. One of the largest and most influential of these, the Harvard Six Cities Study, followed more than 8,000 participants in six towns across the Midwest and New England. Over 15 years, the initial phase of the study tracked each person’s health and measured particulate levels in the air over their communities. Its findings, first released in 1993, showed that even a minuscule increase in fine particulates (just 10 micrograms per cubic meter of air), could cause up to an 18 percent bump in cardiovascular disease. With research like this confirming the health impact of fine particulates, the EPA finally began to regulate them in 1997. Yet Brugge says there’s reason to think that ultrafine particles, which the EPA does not regulate, are even more insidious than their larger counterparts. Unlike fine particulates (PM2.5), which don’t change much from day to day, ultrafines can fluctuate dramatically over the course of a morning or afternoon, depending on the weather and how many cars and trucks are on the road. Ultrafines are also confined to a relatively small area. While fine particulates disperse over an entire city, their tinier cousins stick close to major highways, often spiking dramatically within a few hundred meters of the source. Short distances do matter. During one winter rush hour, as the Tufts mobile testing lab drove within 100 meters of Interstate 93, it tallied more than 120,000 ultrafine particles in every cubic centimeter of air. Moving a few blocks farther away, that number dropped dramatically—to less than 40,000 particles. The reduction might be a result of new particles evaporating, condensing into larger particles, or—most likely—mixing with fresh air as they drift away from the road. But Brugge says one thing is clear: Because ultrafines are mostly concentrated near their source, people living and working immediately next to a highway will disproportionately suffer their effects. At first glance, the health impact of fine and ultrafine particulates seems counterintuitive. Breathing particles of any sort should cause problems in your lungs, not heart, right? But like most things in medicine, it’s not so simple. Fine and ultrafine particulates both cause cardiovascular disease in similar ways. Once they hit your lungs, your body immediately recognizes that something is amiss. “It essentially says, ‘Oh, crap, something’s wrong here,’ and releases cytokines, molecules that control immune response,” says David Weiss, M12, who works on the CAFEH study analyzing health surveys generated as part of the community outreach component of the research project. Those cytokines are used to summon help to the site of the infection, but also affect the activity of the immune system throughout the body. Weiss likens the body’s reaction to the terror-alert system that was put into place after 9/11. “You know, the one that was green, yellow, red,” he says. “The higher levels of cytokines will take you from a level green to a level yellow.” In other words, your whole body goes on high alert, causing elevated levels of inflammation. But constant exposure to fine and ultrafine particulate pollution can cause chronic inflammation. If that happens, white blood cells called macrophages, which are part of the body’s natural defense mechanism, go into overdrive, seeking out bacteria or other foreign objects in the bloodstream. They start attacking whatever’s there with extra gusto—including certain types of cholesterol that accumulate in the bloodstream. As macrophages gorge themselves on this fatty molecule, they (and their cholesterol contents) settle into the inner lining of blood vessels, where they slowly build up and create artery-clogging plaques. Weiss says that some of these deposits may happen anyway as the body ages, but inflammation caused by particulate pollution speeds the process, leading to premature heart attacks and strokes. In this regard, fine and ultrafine particles have identical effects on the body. The big difference between them is their size. The smaller the particle, the more surface area it has per its mass. If that sounds confusing, think of it this way: When you’re holding a bowling ball (or any other solid, for that matter) you’re really only touching one thing—its outermost surface. But smash that bowling ball into tiny pieces, and you’ll end up with dozens of surfaces you can touch. Each new shard increases the total amount of bowling ball material exposed, meaning the surface area of the bowling ball increases. The same is true of particulate pollution—the smaller the particles of a pollutant, the more exposed surfaces they have collectively. That means they’re more likely than larger particles to react with chemicals in the body that trigger an immune response. Essentially, Weiss says, this gives the pollutants that make up ultrafine particles more bang for their buck. They’re more potent than larger particles, so they may lead more quickly to heart disease. And, he adds, they may be small enough to get directly into the bloodstream, where they can do even more damage. “Larger particles can’t cross the barrier from the lungs to the bloodstream,” says Weiss, “but the ultrafine particles can. So because of that, and partly because of their increased exposed surface area, there’s more of an opportunity for them to have reactions that will cause inflammation.” The only way to avoid this inflammation—short of somehow removing particles from the air around you—is to spend less time near major highways. 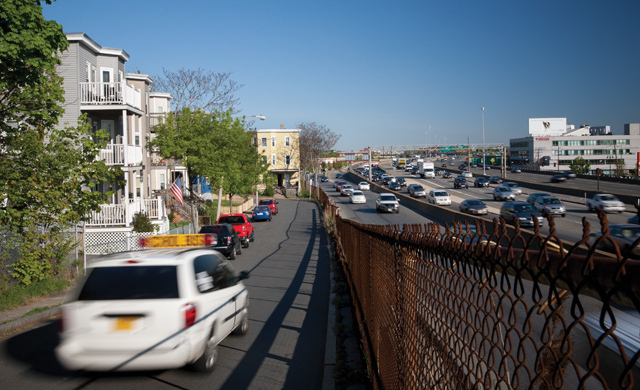 “For people who move away from the highway, it’s like they quit smoking,” says Wig Zamore, a longtime resident of Somerville with a master’s degree in urban planning. Over the past decade, Zamore has worked with community groups on public health and clean-air issues, and is a member of the CAFEH steering committee, a group of academics and community members who help guide the study’s research. “Their risk pretty immediately starts to go down, and for the people who move closer to a highway, their risk immediately starts to go up over a matter of just a couple years,” he says, citing a 2009 study by the University of British Columbia. The problem is, of course, that many people living near highways don’t have the financial means to move. According to Zamore, of the 35 million Americans who live by a major four-lane highway, roughly 18 percent are renters or live in low-income housing. Tina Wang deals with new immigrants in Chinatown every day as a translator for the Chinese Progressive Association, a neighborhood advocacy group. Four years ago, she moved to the United States from China. She says that most of the community members she knows are aware that living near a major highway isn’t great for their health, but they simply have nowhere else to go. Wang is a member of CAFEH’s field staff, a group of 23 people who live mostly in the study’s target neighborhoods. To assess the health impacts of ultrafine particulates in those areas, CAFEH not only needs air samples; it needs biological data, too—so members of the field team go door-to-door, convincing neighbors to answer medical questionnaires, submit to blood pressure tests and give blood samples during weekly clinics held at a central location in each participating neighborhood. Over four years, the field team has canvassed Somerville, Dorchester, Chinatown and Malden—all areas where the CAFEH RV has collected air-quality data. So far, they’ve recruited 700 participants, 450 of whom have attended the CAFEH-run clinics. “To our knowledge, our study is the only one that’s both measuring ultrafines near the highway and looking at biological markers of people living in those areas,” says Brugge. That’s only part of what makes the study distinctive, he says. CAFEH’s philosophy is to involve community members not just as sources of data, but also as colleagues in its research, as Tina Wang and Wig Zamore are. Other researchers in the public health community are taking notice. “[CAFEH] is pretty unique in terms of its blend of hard-science approaches and attempts to both use community residents and keep the community informed throughout the project,” says Jonathan Levy, a professor of environmental health at Boston University, who is on the thesis committees of two Ph.D. students working with CAFEH—Allison Patton from Tufts School of Engineering and Kevin Lane at the BU School of Public Health. Some communities aren’t simply waiting for the final results before they do something. Tucked into a bend in the Mystic River lies Somerville’s Ten Hills neighborhood—a tiny, wedge-shaped slice of land covering 50 acres. The mayor of Somerville calls it home, as do two city aldermen. Driving through, it’s easy to see why there’s an allure to the place. Its trim streets are lined with trees, and people wave to each other in the parks and running trails that flank the river. It’s a gem of a neighborhood. But at 5 p.m. on a Tuesday, with almost no visible traffic nearby, you can hear the steady drone of car and truck engines. Ten Hills is cut off from the rest of Somerville by two major highways. To the east, it’s hemmed in by Route 28, which brings traffic across the Mystic River and into the neighboring city of Medford. To the south, it stops abruptly at Interstate 93. And, he adds, it has a distinct impact on the health of Somervillians. The city is the most densely populated in New England, and with some 75,000 people concentrated on just four square miles of land, more than 11 percent of residents live within 400 meters of a major highway, according to estimates drawn from recent census data. Red dots show elevated mortality rates in towns aligned with major highways in the Boston area. Of 100 cities and towns in eastern Massachusetts, the highlighted communities hold some 75 percent of excess mortality, according to a recent survey. Curtatone is hoping that the CAFEH study results, once published, will help guide city policy to mitigate the effects of pollutants from these roadways. Until then, his team at city hall is working with Brugge on finding interim solutions. Emmanuel Owusu, Somerville’s program manager for public housing, has already begun examining ways to improve indoor air quality near the highway. He’s focused his attention on the city’s largest public housing project, the Mystic River Development, which sits right next to I-93. As is the case in the Ten Hills neighborhood, a front yard and a sidewalk are the only barriers separating the apartments from a highway traveled by an average 168,000 vehicles each day, according to the Massachusetts Department of Public Health. With a grant from the U.S. Department of Housing and Urban Development (HUD), Owusu is working with Tufts environmental engineer John Durant and the community advocacy group STEP (Somerville Transportation Equity Partnership) to study the effectiveness of window filtration units installed in the Mystic River apartments. They’re small, about the size of an average air conditioner, but Owusu says they’re making a big difference in the overall indoor air quality. There may be other solutions. A study by the National Oceanic and Atmospheric Administration found that erecting tall sound barriers between highways and the people who live near them could contain most ultrafine particles inside highway boundaries. Another study from the University of California, Davis, experimented with trees as a natural barrier. Redwoods, researchers found, can remove up to 80 percent of ultrafines. But mitigation efforts such as these can go only so far. At the very least, Stone says, he’d like to see warning signs posted on the bike path that runs alongside the interstate. It’s a small gesture, but it is something that would give residents an idea of what they might be breathing during rush hour. Researchers with the CAFEH project are just beginning to sift through terabytes of air-pollution data from the RV and hundreds of blood samples from participants. They’ve released several preliminary papers this year, and are working toward presenting the study’s main findings in summer 2013. This story first appeared in the Summer 2012 issue of Tufts Medicine magazine. David Levin is a freelance science writer based in Boston. In the middle of World War II, a dense brown fog descends on Los Angeles, stinging residents’ eyes and noses. Some residents fear that the Japanese are waging chemical warfare, but the culprit turns out to be a combination of industrial smoke and auto exhaust. On October 28, stagnant weather conditions trap thick smog over the mill town of Donora, Pa. When it lifts five days later, 20 people are dead and thousands are sickened. It remains one of the worst air pollution events in the United States. Windless conditions drape London in a pea-soup smog. The pollution is so thick that it penetrates indoor areas, shutting down movie theaters. More than 4,000 people later die from the smog’s effects, and 25,000 claim sickness benefits. For the first time, the U.S. Congress passes legislation addressing air pollution as a national problem, pouring $5 million ($85 million in 2012 dollars) into federal air-quality research. Congress sets emission standards for stationary pollution sources such as power plants and steel mills and gives $96 million to state and local governments for air-quality research and control programs. In a major amendment to the 1963 legislation, Congress sets more demanding standards for emissions, including the first regulations for motor vehicles. The Environmental Protection Agency is created to enforce the new standards. In light of studies showing that PM10 (particles 10 microns across) can cause respiratory disease, the EPA singles them out for regulation. Before 1987, the agency regulated only “total suspended particulates”—a term for airborne particles of all sizes. In the early ’90s, multiyear studies published by Harvard University and the American Cancer Society show clear links between fine particulates (PM2.5) and cardiovascular disease. As a result, the EPA begins to monitor and regulate PM2.5. The EPA raises its 24-hour exposure standard for PM2.5, bringing the acceptable level down from 65 micrograms (per cubic meter of air) to 35 micrograms. CAFEH steering committee member Wig Zamore testifies before the EPA’s Clean Air Scientific Advisory Committee to encourage the changes. Ultrafine particulates (PM0.1) remain unregulated.